Crann’s publication ‘the ABC of trees, hedgerows and development’ highlights the importance of trees and hedgerows and is a guide on how to protect and integrate them in developments. “I am delighted to have the opportunity to introduce this booklet as the need to protect our existing trees and hedgerows has never been greater. This is a timely publication given the current boom in building development and it should be read and acted on by all involved in planning and in the construction industry. 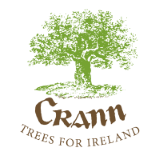 Trees in Ireland are under pressure, especially where they are most needed. In urban and semi-urban areas, trees and hedgerows are disappearing at an alarming rate due to incessant development. Sustainable development is what we all would like to see occurring throughout Ireland but sadly too many fine trees are still being removed even though they could have easily been retained and would greatly enhance new areas of housing. New (industrial) estates are appearing on the fringes of our towns and cities at an astonishing rate. It is essential that we include trees and hedgerows as part of these developments as trees create a healthier working environment and help to blend the outlines of buildings into the countryside. I am reminded of Bill Vaughan’s famous quote: “Suburbia is where the developer bulldozes out the trees, then names the streets after them.” This book will aid planners, developers, potential homeowners and community development groups to appreciate the value and importance of trees and hedgerows, and integrate them into new developments. This full colour 36 page booklet by Janice Fuller is available to order from Crann. Send your order with €5 per copy (including P&P) cheque/postal order (payable to Crann), P.O. Box 860, Celbridge, Co. Kildare and we shall post out your order to you.